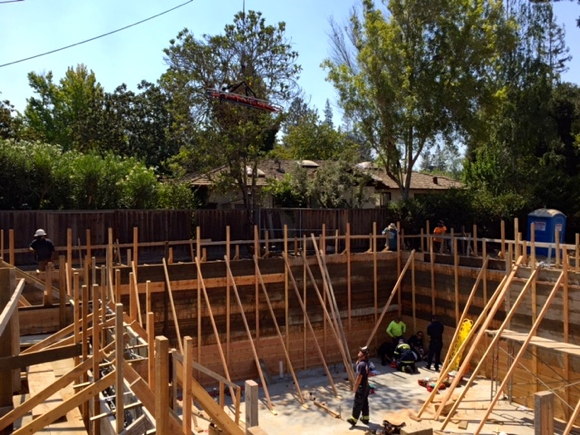 Menlo Park Firefighters responded to 1650 Oak Avenue in Menlo Park on Wednesday, August 24, 2016 at 1.42 pm to a report of a construction worker who had accidentally fallen into a basement under construction at the site. Upon their arrival at 1.49 pm, firefighters located the conscious male victim in a corner of an open basement and performed cervical spine precautions and treated the victims severely fractured leg. 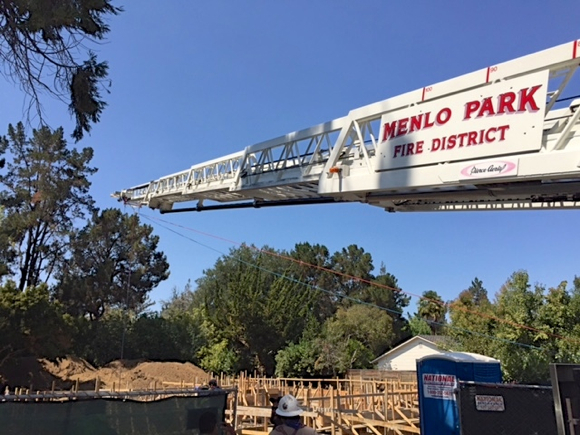 Due to an unstable access system into the basement and based upon the size of the patient and his injuries, Captain Scott Hylton on Engine 4 requested that Menlo Truck 1 respond and perform an aerial pick of the victim using the 100 foot ladder and rope systems, essentially as a sky crane, to lift the patient out of the open basement and out to the street for transport to Stanford Hospital’s Emergency Trauma Center. Just gotta love the Menlo Fire Department.